If time permits, we invite you to drop into the store at 43 Toorak Rd, South Yarra where professional staff will record your measurements for inclusion in our database. The visit will also provide a good opportunity to observe our wide range of quality suits and accessories. 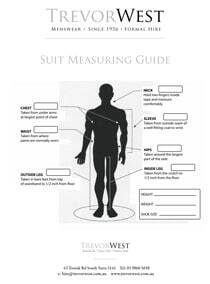 Measure around the fullest part of your chest – under your arms across your shoulder blades. Using your favourite suit or sports jacket, measure the inside seam of the sleeve from under the armpit to the bottom of the sleeve. Measure the seam in the middle of the back of the jacket from below the collar to the bottom. Measure around your trouser waistline – where you normally wear your belt. Using your favourite pair of tailored trousers (not jeans), lay them flat on a table and measure the inside leg seam from crotch to trouser bottom. Measure around your collar neckline allowing a finger thickness for comfort. NB The tape should be held firmly around your body, not tight. Do not ‘add on’, or record the next size up ‘just in case’.